What is your strategy for gaining wealth? Getting rich isn’t a matter of hitting the lottery. For most people it will drain their wealth and make someone else richer. Maybe you are working tirelessly at your job hoping to achieve wealth. Hard work is necessary, but is your effort focused on the things that will bring you fulfillment in life while building your wealth? Investing the stock market can help you build wealth. But you can also lose a fortune if you don’t know what you are doing. You can hire a financial advisor to manage your money. But if your financial advisor was that good, why wouldn’t he or she just take thier own advice and create their own fortunes? There are those fortunate few who were born with the gift of being able to throw a curveball, a freethrow, or a touchdown pass better than anyone else, and they can negotiate multi-million dollar contracts. How many of them have squandered that wealth! Unfortunately a lot of wealth was made through illegal and unethical means. At the end of the day you have to live with yourself and feel good about who you are as a person. And there will always be those who were born into wealth or stumbled into it through dumb luck. Isn’t it amazing how they make it seem like it was all skill on their part? Everyone else has to learn to create wealth. You can get rich too. Learning to get rich isn’t a skill we are born with. Many try and fail, and fall into a trap that reinforces behaviors that prevent them from achieving wealth. Others sacrifice their relationships, morals, or quality of life in the pursuit of riches. Many people actually have a fear of success. So who can coach you to achieve the financial freedom and lifestyle you desire? A lot of rich people can’t explain how they got rich. Others can’t loan you their pitching arm so you can land a contract with a major league team. An oil tycoon might tell you how he did it, but what are the odds you can emulate him and go out and start your own oil company? And unless you are a straight ‘A’ student you may not want to go out and start your own bio-tech company. 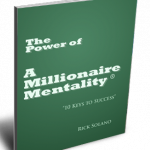 Rick Solano is that rare individual who has made millions of dollars; who can explain in layman’s terms how anyone can do it; and who wants to share his secrets of creating wealth. Most importantly, he puts it in the framework of making a fulfilling life. It all starts with adopting the Millionaire Mentality. Invest one day and attend the Millionaire Mentality® Workshop. Your only regret will be that you didn’t start sooner. But it’s never too late, and you are never too old. Make a commitment to yourself right now to adopt the Millionaire Mentality®. Rick Solano has achieved success, financial freedom, wealth and personal fulfillment. Author of The Power of a Millionaire Mentality®, he is frequently featured as a public or keynote speaker, giving inspirational “how to” success tips to others in old and new economy companies and businesses as well as organizations. Comfortable with a wide range of audiences and groups, Solano engages everyone – reaching out to employees, managers, and executive leaders. He provides listeners with tools to tap into the energy within them and take positive action to jump start growth and change in their lives. An expert in workplace leadership, Solano helps individuals in organizations and companies create an atmosphere of esprit de corps and connect to a more meaningful and productive work environment. Through his seminars, Solano personally leads attendees to personal and financial success. These uplifting, interactive events offer participants positive strategies for growth and techniques for change in their personal, financial, and professional lives and reveal how to balance the practical, material side of human existence with the spiritual.